This article is about the role of bishops in the Catholic Church. For information on the historical origin of the office, see Bishop. A Latin Church Catholic bishop wearing the pontifical vestments and carrying a crosier. Johann Otto von Gemmingen, Prince-Bishop of Augsburg in Bavaria, 1591–1598, carrying a crosier and wearing a mitre and pluviále. Diocesan bishops—known as eparchs in the Eastern Catholic Churches—are assigned to govern local regions within the Catholic Church known as dioceses in the Latin Church and eparchies in the Eastern Churches. Bishops are collectively known as the College of Bishops and can hold such additional titles as archbishop, cardinal, patriarch, or pope. As of 2009 there were approximately 5,100 bishops total in the Latin and Eastern churches of the Catholic Church. The traditional role of a bishop is to act as head of a diocese or eparchy. Dioceses vary considerably in geographical size and population. A wide variety of dioceses around the Mediterranean Sea which received the Christian faith early are rather compact in size, while those in areas more recently evangelized, as in some parts of Sub-Saharan Africa, South America and the Far East, tend to be much larger and more populous. Within his own diocese a Latin Church bishop may use pontifical vestments and regalia, but may not do so in another diocese without, at least, the presumed consent of the appropriate ordinary. Article 401.1 of the Latin-Rite Code of Canon Law states that "A diocesan Bishop who has completed his seventy-fifth year of age is requested to offer his resignation from office to the Supreme Pontiff, who, taking all the circumstances into account, will make provision accordingly". One form for the coat of arms of a Latin Catholic bishop. A "diocesan bishop" is entrusted with the care of a local Church (diocese). He is responsible for teaching, governing, and sanctifying the faithful of his diocese, sharing these duties with the priests and deacons who serve under him. To "teach, sanctify and govern" means that he must (1) oversee preaching of the Gospel and Catholic education in all its forms; (2) oversee and provide for the administration of the sacraments; and (3) legislate, administer and act as judge for canon-law matters within his diocese. He serves as the "chief shepherd" (spiritual leader) of the diocese and has responsibility for the pastoral care of all Catholics living within his ecclesiastical and ritual jurisdiction. He is obliged to celebrate Mass every Sunday and Holy Day of Obligation with the intention of praying for those in his care, assign clergy to their posts in various institutions and oversee finances. A bishop is to have a special concern for priests, listening to them, using them as counsellors, ensuring that they are adequately provided for in every way, and defending their rights set forth in the Code of Canon Law. Latin Catholic bishops also must make regular ad limina visits to the Holy See every five years. Because of their function as teachers of the faith, it is customary in some English-speaking countries, to add to the names of bishops the postnominal title of "D.D." (Doctor of Divinity) and to refer to them with the title "Doctor". Only a bishop has authority to confer the sacrament of holy orders. In the Latin Church the minor orders were abolished after the Second Vatican Council. In Eastern Catholic Churches, a monastic archimandrite may tonsure and institute his subjects to minor orders; however, the tonsure and minor orders are not considered to be part of the sacrament of holy orders. The sacrament of Confirmation is normally administered by a bishop in the Latin Church, but a bishop may delegate the administration to a priest. In the case of receiving an adult into full communion with the Catholic Church the presiding priest will administer Confirmation. In the Eastern Catholic Churches, Confirmation (called Chrismation) is normally administered by priests as it is given at the same time as baptism. It is only within the power of the diocesan bishop or eparch to bless churches and altars, although he may delegate another bishop, or even a priest, to perform the ceremony. On Holy Thursday Latin Catholic bishops preside over the Mass of the Chrism. Though Oil of the Sick for the sacrament of Anointing of the Sick is blessed at this Mass, it may also be blessed by any priest in case of necessity. Only a bishop may consecrate Chrism. In the Eastern Catholic Churches chrism is consecrated solely by heads of churches sui juris (patriarchs and metropolitans) and diocesan bishops may not do so. Only a bishop or other ordinary may grant imprimaturs for theological books, certifying that they are free from doctrinal or moral error; this is an expression of the teaching authority, and education responsibility of the bishop. Prior to the Second Vatican Council, it was also the prerogative of the bishop to consecrate the paten and chalice that would be used during the Mass. One of the changes implemented since the Council, is that a simple blessing is now said and it may be given by any priest. 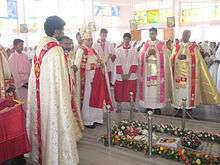 In both Western and Eastern Catholic churches, any priest can celebrate the Mass. In order to offer Mass publicly, however, a priest is required to have permission from the local Ordinary—authority for this permission may be given to pastors of parishes for a limited period, but for long-term permission recourse to the diocesan bishop is usually required. A celebret may be issued to travelling priests so that they can demonstrate to pastors and bishops outside of their own diocese that they are in good standing. However, even if a priest does not possess such a document, he may celebrate the sacraments if the local bishop or pastor judges that the visiting priest is a person of good character. In the East an antimension signed by the bishop is kept on the altar partly as a reminder of whose altar it is and under whose omophorion the priest at a local parish is serving. For priests to validly celebrate the sacrament of Penance they must have faculties (permission and authority) from the local bishop; however when the penitent is in danger of death, a priest has both the right and obligation to hear the confession no matter where he may be. To preside at matrimony ceremonies, Latin Church priests and deacons must have appropriate jurisdiction or delegation from a competent authority. In the Latin branch of the Catholic Church, the teaching is that it is the couple themselves who administer the graces of the sacrament; thus, although it is normally an ordained person who officiates at a marriage ceremony, a bishop may delegate a lay person to be present for the exchange of vows; this would be done only in extreme cases such as in mission territories. In the Eastern tradition, the clergy not only witness the exchange of vows but must impart a blessing for a valid marriage to have taken place. Unless a particular bishop has forbidden it, any bishop may preach throughout the Catholic Church and any priest or deacon may also preach anywhere (presuming the permission of local pastor) unless his faculty to preach has been restricted or removed. The cathedral of a diocese contains a special chair, called a cathedra, sometimes referred to as a throne, set aside in the sanctuary for the exclusive use of its Ordinary; it symbolises his spiritual and ecclesiastical authority. 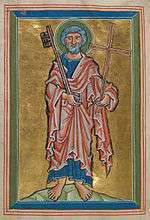 A bishop who has been canonically selected for a see, but hasn't yet taken possession of it. A titular bishop (or titular archbishop) is a bishop assigned to a titular see, which is usually the name of a city or area that used to be the seat of a diocese, but whose episcopal see (diocese) is no longer functioning as such. Titular bishops often serve as auxiliary bishops, as officials in the Roman Curia, in the Patriarchal Curias of Eastern Churches, as papal diplomatic envoys (notably apostolic nuncios or apostolic delegates), or head certain missionary pre-diocesan jurisdictions (notably as apostolic vicar). Since 1970, a coadjutor bishop uses the title of the see he is assigned to, and a bishop emeritus uses the title of his last residential see. A suffragan bishop leads a diocese within an ecclesiastical province other than the principal diocese, the metropolitan archdiocese. An auxiliary bishop is a full-time assistant to a diocesan bishop. Auxiliaries are titular bishops without the right of succession, who assist the diocesan bishop in a variety of ways and are usually appointed as vicars general or episcopal vicars of the diocese in which they serve. A coadjutor bishop is a bishop who is given almost equal authority to that of the diocesan bishop; he has special faculties and the right to succeed the incumbent diocesan bishop. The appointment of coadjutors is seen as a means of providing for continuity of church leadership. Until recent times, there was the possibility of a coadjutor bishop not having the right of succession. A bishop who is consecrated as such, but holds an office that as such doesn't require episcopal rank (so the incumbent won't be made a titular bishop), just that of Prelate, notably as Territorial prelate. When a diocesan bishop or auxiliary bishop retires, he is given the honorary title of "emeritus" of his last see, i.e., archbishop emeritus, bishop emeritus, or auxiliary bishop emeritus of the see. For the (arch)bishop of a diocese, "emeritus" is inserted into the title for the last diocese that the (arch)bishop occupied. An example in usage would be: "Most Reverend John Jones, Bishop Emeritus of the Diocese of Anytown." For a cardinal, who does not cease to be a cardinal and a bishop, though no longer bishop of a see, it would be: "Cardinal James Smith, Archbishop Emeritus of the Archdiocese of Anycity." On his resignation as Pope (Bishop of Rome), Benedict XVI became His Holiness Benedict XVI, Supreme Pontiff Emeritus or Pope Emeritus. A cardinal is a member of the clergy appointed by the Pope to serve in the College of Cardinals. Members of the College aged under 80 elect a new pope, who is in practice always one of their number, on the death or resignation of the incumbent. 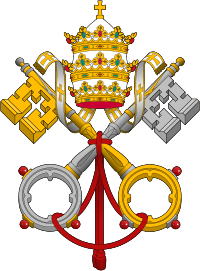 Cardinals also serve as papal advisors and hold positions of authority within the structure of the Catholic Church. Under canon law, a man appointed a cardinal must normally be a bishop, or accept consecration as a bishop, but may seek papal permission to decline. Most cardinals are already bishops when appointed, the majority being archbishops of important archdioceses or patriarchates, others already serving as titular bishops in the Roman Curia. Recent popes have appointed a few priests, most of them renowned theologians, to the College of Cardinals, and these have been permitted to decline episcopal consecration. The pope is the man who possesses the sacrament of Holy Orders as a bishop and who has been chosen to be Bishop of Rome. The Catholic Church holds that the College of Bishops as a group is the successor of the College of Apostles. The Church also holds that uniquely among the apostles Saint Peter was granted a role of leadership and authority, giving the Pope the right to govern the Church together with the bishops, and making his leadership necessary for the completion of the College. Hence, Catholicism holds that the Bishop of Rome, as successor of Peter, possesses this role: the Pope, uniquely among bishops, may speak for the whole Church, and a council of bishops is incomplete without the approval of the pope. Papal pronouncements which meet the requirements of the decree on papal infallibility of the First Vatican Council, and no others, even in matters of faith and morals, are deemed to be infallible. Papal infallibility has been invoked only twice since the doctrine was instituted and both are about Mary: her Immaculate Conception (declared by Pope Pius IX in 1854 and grandfathered in after the First Vatican Council’s declaration of papal infallibility in 1870) and her bodily Assumption into heaven (declared by Pope Pius XII in 1950). Catholicos is an Eastern title roughly similar to that of patriarch. In the Catholic Church it is applied to a prelate who is also a major archbishop. Major archbishops are the heads of some of the Eastern Catholic Churches. The major archbishops' authority within their respective sui juris churches is equal to that of a patriarch, but they receive fewer ceremonial honours. In the Catholic, Anglican, and some other Churches a primate is usually the bishop of the oldest diocese and/or the capital of a (present or former) nation; the title is one of honor. A metropolitan bishop is an archbishop with minor jurisdiction over an ecclesiastical province; in practice this amounts to presiding at meetings and overseeing a diocese which has no bishop. In Eastern Catholicism a metropolitan may also be the head of an autocephalous, sui juris, or autonomous church when the number of adherents of that tradition is small. In the Latin Church, metropolitans are always archbishops; in many Eastern churches, the title is "Metropolitan," with some of these churches using "archbishop" as a separate office. Since the publication of the new Code of Canon Law in 1983 by Pope John Paul II, all members of the Catholic clergy are forbidden to hold public office without the express permission of the Holy See. The appointment of bishops in the Catholic Church is a complicated process that requires the participation of several officials. In the Latin Church, the local synod, the papal nuncio (or apostolic delegate), various dicasteries of the Roman Curia, and the Pope all take a part; since the 1970s it has become common practice for the nuncio to solicit input from clergy and laity within the vacant diocese. In patriarchal and major archiepiscopal Eastern Churches, the permanent synod, the holy synod, and the patriarch or major archbishop also play a role in the selection of bishops. The Catholic Church has always taught that bishops are descended from a continuous line of bishops since the days of the apostles, which is known as apostolic succession. Since 1896, when Pope Leo XIII issued the bull Apostolicae curae, the Catholic Church has not recognised Anglican orders as valid, because of changes in the ordination rites that took place in the 16th century as well as divergence in the understanding of the theology of episcopacy and Eucharist. However, this view has since been complicated because Old Catholic bishops, whose orders are fully recognised as valid by Rome, have acted as co-consecrators in Anglican episcopal consecrations. According to the church historian Timothy Dufort, by 1969 all Church of England bishops had acquired Old Catholic lines of apostolic succession fully recognised by the Holy See. To remove, then, all shadow of doubt, this holy Council solemnly declares that the Churches of the East, while remembering the necessary unity of the whole Church, have the power to govern themselves according to the disciplines proper to them, since these are better suited to the character of their faithful, and more for the good of their souls. However, the Holy See does not recognise as valid the orders of any group whose teaching is at variance with core tenets of Christianity even though it may use the proper ritual. The recent practice of Independent Catholic groups to ordain women has added a definite cloudiness to the recognition of the validity of orders, as the act of ordaining women as priests or bishops is incompatible with Catholicism and Eastern Orthodoxy. The practice by some independent clergy of receiving multiple ordinations also demonstrates an understanding of Holy Orders which is at variance with Catholicism and Orthodoxy, both of which hold that a person is either ordained or not. The everyday dress of Latin Church bishops may consist of a black (or, in tropical countries, white) cassock with amaranth trim and purple fascia, along with a pectoral cross and episcopal ring. The 1969 Instruction on the dress of prelates stated that the dress for ordinary use may instead be a simple cassock without coloured trim. Since 1969, a black suit and clerical shirt, already customary in English-speaking countries, has become very common also in countries where previously it was unknown. A Latin Church bishop's choir dress, which is worn when attending but not celebrating liturgical functions, consists of the purple cassock with amaranth trim, rochet, purple zuchetto, purple biretta with a tuft, and pectoral cross. The cappa magna may be worn, but only within the bishop's own diocese and on especially solemn occasions. The mitre, zuchetto, and stole are generally worn by bishops when presiding over liturgical functions. For liturgical functions other than the Mass the bishop typically wears the cope. Within his own diocese and when celebrating solemnly elsewhere with the consent of the local ordinary, he also uses the crosier. When celebrating Mass, a bishop, like a priest, wears the chasuble. 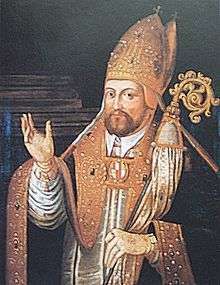 The Caeremoniale Episcoporum recommends, but does not impose, that in solemn celebrations a bishop should also wear a dalmatic, which can always be white, beneath the chasuble, especially when administering the sacrament of holy orders, blessing an abbot or abbess, and dedicating a church or an altar. The Caeremoniale Episcoporum no longer makes mention of pontifical gloves, pontifical sandals, liturgical stockings (also known as buskins), the maniple, or the accoutrements that it once prescribed for the bishop's horse. The everyday dress of Eastern Catholic bishops is often the same as their Latin Church counterparts: black clerical suite with pectoral cross or panagia. When attending liturgical functions at which he does not celebrate, an Eastern Catholic bishop usually wears a mantya, panagia and an engolpion if he is a patriarch or metropolitan bishop. He will also carry a pastoral staff in the form of a walking stick topped by a pommel. Eastern Catholic bishops do not normally use an episcopal ring. When participating in the Divine Liturgy, an Eastern Catholic bishop will wear the sakkos (Imperial dalmatic), omophorion, epigonation and Eastern-style mitre. The most typical mitre in the Eastern Catholic churches is based on the closed Imperial crown of the late Byzantine Empire. It is made in the shape of a bulbous crown, completely enclosed, and the material is of brocade, damask or cloth of gold. It may be embroidered, and richly decorated with jewels. There are normally four icons attached to the mitre: (Christ, the Theotokos, John the Baptist and the Cross. Eastern mitres are usually gold, but other liturgical colours may be used. The mitre is often topped by a cross, either made out of metal and standing upright, or embroidered in cloth and lying flat on the top. He will also carry a crosier of the Eastern style. ↑ "Catechism of the Catholic Church – Christ's Faithful – Hierarchy, Laity, Consecrated Life". Vatican.va. 1946-02-20. Retrieved 2014-04-01. ↑ "Catechism of the Catholic Church – The sacrament of Holy Orders". Vatican.va. Retrieved 2014-04-01. ↑ "CCC – PART 1 SECTION 2 CHAPTER 3 ARTICLE 9 PARAGRAPH 3". Vatican.va. 1975-12-14. Retrieved 2014-04-01. ↑ "Catechism 1556". Retrieved 6 October 2014. ↑ "Catechism 1555–1556". Retrieved 6 October 2014. ↑ "Living Bishops". Catholic-Hierarchy.org. David M. Cheney. Retrieved 23 January 2015. ↑ "APOSTOLIC LETTER ORDINATIO SACERDOTALIS OF JOHN PAUL II TO THE BISHOPS OF THE CATHOLIC CHURCH ON RESERVING PRIESTLY ORDINATION TO MEN ALONE". Libreria Editrice Vaticana. Retrieved 30 May 2014. ↑ "Canon 390". Retrieved 6 October 2014. ↑ "Code of Canon Law: Diocesan Bishops". Retrieved 6 October 2014. ↑ "Canon 376". 1983 Code of Canon Law. Libreria Editrice Vaticana. Retrieved 27 July 2009. ↑ "Canon 369". 1983 Code of Canon Law. Libreria Editrice Vaticana. Retrieved 27 July 2009. ↑ "Canon 381". 1983 Code of Canon Law. Libreria Editrice Vaticana. Retrieved 27 July 2009. ↑ "Canon 386.1". Retrieved 6 October 2014. ↑ "Canon 383.1,2". Retrieved 6 October 2014. ↑ "Canons 388.2 and 392.2". Retrieved 6 October 2014. ↑ "Canon 384". Retrieved 6 October 2014. ↑ "Canon 399.1". Retrieved 6 October 2014. ↑ "Catechism 1554". Retrieved 6 October 2014. ↑ "Canon 883.2". Retrieved 6 October 2014. ↑ "Canon 1207". Retrieved 6 October 2014. ↑ "Canon 903". Retrieved 6 October 2014. ↑ "Canon 966.1". Retrieved 6 October 2014. ↑ "Canons 966.1 & 976". Retrieved 6 October 2014. ↑ "Catechism of Catholic Church para 1623". Retrieved 6 October 2014. ↑ "Canon 763". Retrieved 6 October 2014. ↑ "Canon 764". Retrieved 6 October 2014. ↑ "Canons 403.1, 406". Retrieved 6 October 2014. ↑ "Canon 403.3". Retrieved 6 October 2014. ↑ "Vatican Diary / The identity cards of the last two popes". Retrieved 6 October 2014. ↑ "Lumen Gentium 18". Archived from the original on 6 September 2014. Retrieved 6 October 2014. ↑ "Canon 285.3". Retrieved 6 October 2014. ↑ Timothy Dufort, The Tablet, May 29, 1982, pp. 536–538. ↑ "Decree on Ecumenism/Unitatis Redintegratio 16". Archived from the original on 6 March 2013. Retrieved 6 October 2014.